Papa John’s is a leading pizza franchise with well over 400 stores in the UK and over 5,000 stores in more than 40 international markets and territories. Since 1984, when Papa John’s first started out in the U.S., the company has recruited and worked successfully with hundreds of franchisees. Naturally, we look for the very best candidates to work with us as franchisees. They become custodians of our brand so need to be motivated, enthusiastic, hard-working and want to be part of a growing team. They should share our values and outlook on providing a superior product and customer service. Our franchisees come from all cultures and walks of life and their levels of experience and backgrounds can vary hugely. Yet, with the right attitude and correct and thorough training, plus a world-class service and product, all the ingredients are in place to create a successful franchised business. Interpersonal and people skills are important, as franchisees deal with customers as well as lead a team on a daily basis. In addition to excellent written and spoken communication skills, the best franchisees are organisers with a can-do attitude – they are people who get things done. Franchisees need to be as dedicated and passionate as us and also able to adapt to a proven way of working. The desire to roll-up sleeves and get stuck in, which means everything from making pizza through to managing staff, also goes a long way! Therefore, our franchisee recruitment process is detailed and very much a two-way evaluation. First, we meet face-to-face, then suitable candidates are invited to an in-store experience day. The agenda is carefully designed for them to observe and learn about the culture and values of Papa John’s and also experience how one of our stores is run. We minimise the numbers of people we invite to HQ to ensure they receive individual attention and importantly we can get to know them. It means they get a real taste for what has made Papa John’s so successful and what it really takes to run a franchised store. At each stage of the recruitment process the franchisee and our team at Papa John’s ensure everyone is keen to move forwards. By the time we get to the business planning and franchisee approval panel interview, everyone should have a very clear idea of what’s expected. This meeting is the chance for the franchisee to present their business plan and show they have completed their own due diligence and homework, particularly on the financial aspect of their business. Although we provide a business planning template all the work and research that goes into this plan must come from the franchisee. It’s the chance to shine and there is no limit to the research the candidate can undertake. We want to give everyone a chance and the opportunity to shine. We are looking for capable and enthusiastic individuals who will go-on to become successful multi-store owners and so they must show initiative but be willing to work with us and take advice too. 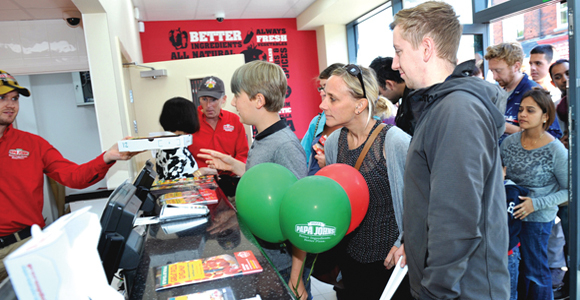 As one of the largest pizza companies in the world, Papa John’s has opportunities for franchisees throughout the UK. Help is provided with location selection and full turn-key opening of stores. As a franchise, the company supplies all the assistance needed to get your successful Papa John’s up and running. If you think you have what it takes to become a successful Papa John’s franchisee then please visit our website for further information: www.papajohns.co.uk/franchise.